A consistent percentage of patients with metastatic non-small cell lung cancer (NSCLC) derives no or only marginal benefit from immunotherapy (IO). Since serum sodium has been linked to both prognosis in NSCLC and modulation of immune cells activity, we aimed to assess the association between low baseline serum sodium concentration (≤ 135 mEq/L) and clinical outcomes of patients with metastatic NSCLC treated with IO. We included metastatic NSCLC patients treated with checkpoint inhibitors in our department from April 2013 to April 2018 with available baseline serum sodium concentration. Demographics, clinical and pathological characteristics were collected. Survival analyses were performed using the Kaplan-Meier method and the Cox proportional-hazards model. Of 197 patients included, 26 (13%) presented low baseline serum sodium concentration. Patients in the low sodium cohort experienced a poorer disease control rate (OR 0.36; 95% CI, 0.15–0.86; Wald test P = .02), median overall survival (OS) (2.8 vs. 11.6 months; HR 3.00; 95% CI, 1.80–4.80; P < .001) and progression-free survival (PFS) (1.8 vs. 3.3 months; HR 2.60; 95% CI, 1.70–3.90; P < .001) compared to patients in the control cohort. At multivariate analyses, low baseline serum sodium concentration was independently associated with disease control and OS, but not with PFS. Our study showed for the first time that low baseline serum sodium concentration is associated with impaired clinical outcomes in patients with metastatic NSCLC treated with IO. The role of serum sodium concentration in this setting warrants further pre-clinical and clinical investigation. The online version of this article ( https://doi.org/10.1007/s11523-018-0599-5) contains supplementary material, which is available to authorized users. Giovanni Fucà, Giulia Galli, Marta Poggi, Giuseppe Lo Russo, Claudia Proto, Martina Imbimbo, Milena Vitali, Monica Ganzinelli, Claudia Lanti, Giuliano Molino, Fabiano Stangoni, Nicoletta Zilembo, Filippo de Braud, Marina Chiara Garassino, and Diego Signorelli declare that they have no conflicts of interest that might be relevant to the contents of this manuscript. 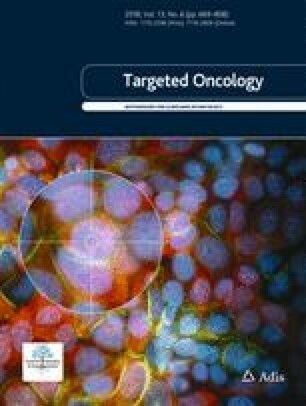 Cassetta L, Kitamura T. Macrophage targeting: opening new possibilities for cancer immunotherapy. Immunology. 2018. https://doi.org/10.1111/imm.12976.